Moscow's bourses continued last week's slide Monday, reaching their lowest levels since October after relief that the weekend's popular protests against Duma election results did not end in violence and escalation. The MICEX Index closed down 3.32 percent at 1,349.96 and the dollar-denominated RTS Index fell 3.3 percent to 1,363.97. The gains of an earlier bounce in trading were erased. The MICEX Index is now once again below the bottom of 1,355.38 it reached during August panic selling when markets plunged after a U.S. downgrade and rising problems in the euro zone. International bourses reversed modest gains made in the wake of Friday's compromise deal aimed at mitigating Europe's debt crisis woes. The FTSE 100 and the S&P 500 were both down almost 2 percent at 10:00 p.m. Moscow time. Oil was down slightly in New York. 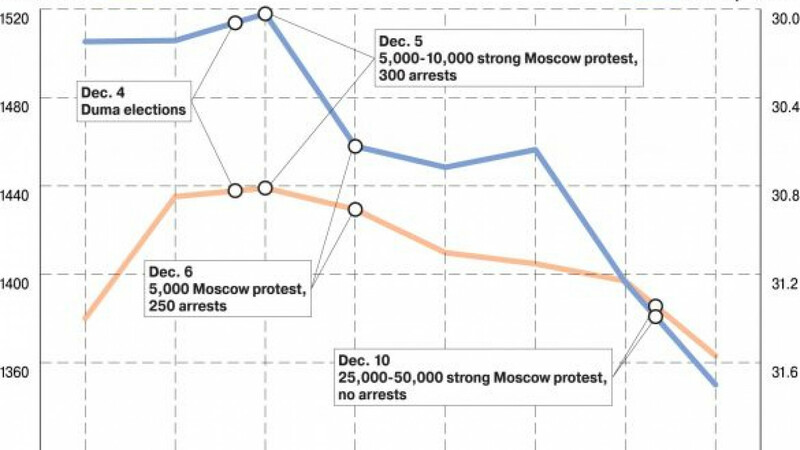 Russian bourses reacted to swelling popular unrest last week in Moscow and decoupled from other global stock exchanges. Experts said political risk was being factored back into the market. "Investors have spent 12 years without having to worry too much about political risk in Russia," Kingsmill Bond, Russia strategist at Citibank, told The Moscow Times. "It is fair to say investors have been surprised by last week's developments and have been reacting to them." Billionaire Mikhail Prokhorov announced Monday that he would challenge Prime Minister Vladimir Putin for the presidency in the March 2012 elections. "If you look back over the history of the Russian market there have been two key determinants, domestic politics and the oil price," Bond said. "So it is quite significant what is happening." U.S. investment bank JPMorgan said in a research note that Russian stocks could remain "repellent" for months to come on the back of new political risks, Bloomberg reported. The ruble has also fallen. Though the Central Bank set its Tuesday rate at 31.4134 rubles to the dollar Monday, the ruble had previously dropped against the dollar for seven consecutive days. In Monday's equity trading, state-owned bank VTB was down 3.69 percent, Gazprom lost 3.24 percent and oil giant Rosneft fell 3.69 percent. Clemens Grafe, chief Russia economist at Goldman Sachs, said the unpredictability and opaque nature of re-energized Russian politics was causing nervousness. "Investors want to stay on the sidelines because they just do not know what is going on," he said. A Western embassy source in Moscow who requested anonymity to speak freely told The Moscow Times that many companies had been in touch with the embassy's economic section about the unfolding political situation. "What companies want is stability and predictability, especially if they're investing in the market for the first time," said Chris Gilbert, executive director at the Russo-British Chamber of Commerce. "Seeing people come out on the streets in protest at what are fairly disputable election results is rattling." Markets are not fearful of the protests in of themselves, but worry about the government's response. Specifically, this means that the reset with the United States may be endangered by a drive to seek the distraction of an external enemy, or that expensive populist policies may undermine Russia's fiscal position. But while another opposition demonstration is scheduled for Dec. 24, there is as yet little sense that the authorities have lost control. "Uncertainty in Russian politics is back," said Roland Nash, chief strategist at Verno Capital. "But there is a running assumption that this is not a protest that will lead to any regime-threatening moment."